The costs of non-traditional policies, when considered carefully, appear manageable, implying that we should not rule out the further use of such policies if economic conditions warrant. I’m the Bernank! I’m helicopter Ben! If massive money printing hasn’t worked yet, I’ll keep doing it! Forever if necessary! And how did the market react to Ben’s speech? As you can see from the gold chart for last week, gold did really, really well on Friday, up over 2.25%. I guess the prospect of runaway inflation is good for gold; who knew? Finally, at long last, the increasing price of gold is also helping gold stocks. Here’s a great example (click on the chart to enlarge; this is an important chart to study). 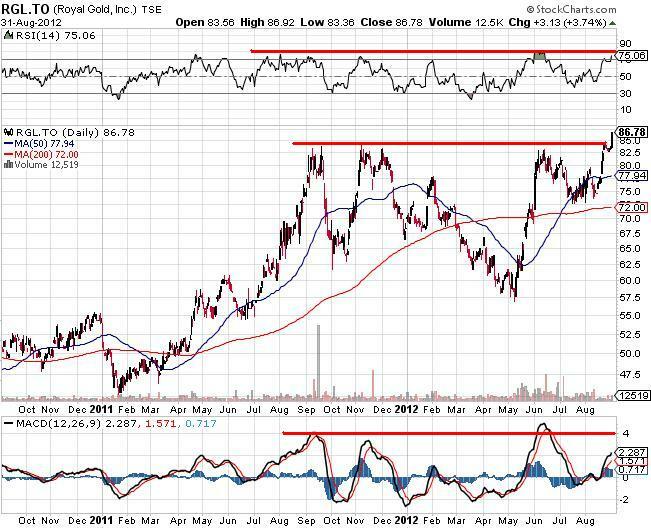 This is the chart of RGL.TO – Royal Gold Inc., a blue chip gold royalty company (that actually pays a dividend). Pay close attention to the red horizontal resistance lines. Approximately $85 is a key resistance level, and that’s the level that halted the increases in September, October, November and December, 2011, and again in June of this year. 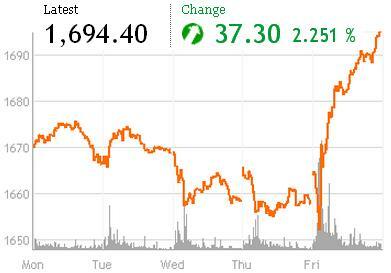 And yet, on Friday, Royal Gold closed at $86.78, and all time high. “There ain’t no resistance when you make an all time high.” Everyone who owns the stock, owns it at a profit. In other words no-one will be selling to cover their loses, since there aren’t any. The RSI, at the top of the chart, suggests a correction, but that could be a few days or weeks in the future, and it could be minor. The MACD is not at the same excessive levels it was in the prior three peaks, so there could be room to run. Regardless, for those who like to Buy High and Sell Higher, this is a beautiful chart. There is no overhead resistance, so we have room to run. So does that mean I’ll be buying when the markets open on Tuesday? Nope. I’ve got nice positions, so I have no need to throw more money at it today. 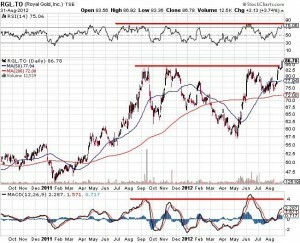 However, I might do some covered writing if Royal Gold hits $90. As an aside, so far this year, of the stocks I still own, Royal Gold is one of my best performers, up about 38% (not including dividends). (My better performers are CEF.A.TO – Central Fund of Canada, up 41%, and FR.TO – First Majestic Silver Corp. up 69%). As at the end of August, my portfolio is up 16.3% on the year, which won’t win me any awards, but it’s better than the alternative. I remain 17% in cash, to be deployed in the event of market weakness, but for now I’m content to just sit, watch, and enjoy the long weekend. Thanks for reading, and, if you live in Canada, keep an eye on your maple syrup (apparently someone just stole $30 million of it……. ).